We propose a new framework of optimal t-matchings excluding prescribed t-factors in bipartite graphs. It is a generalization of the nonbipartite matching problem and includes a number of generalizations such as the triangle-free 2-matching, square-free 2-matching, and even factor problems. We demonstrate a unified understanding of those generalizations by designing a combinatorial algorithm for our problem under a reasonable assumption, which is broad enough to include the specific problems listed above. We first present a min-max theorem and a combinatorial algorithm for the unweighted version. 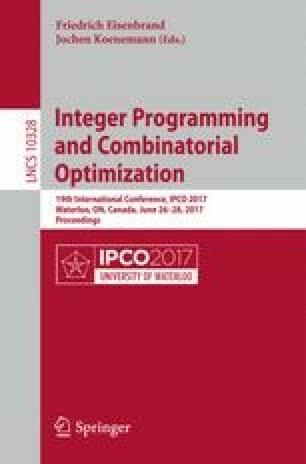 We further provide a linear programming formulation with dual integrality and a primal-dual algorithm for the weighted version. A key ingredient of our algorithm is a technique of shrinking forbidden structures, which commonly extends the techniques of shrinking odd cycles, triangles, and squares in Edmonds’ blossom algorithm, in the triangle-free 2-matching algorithm, and in the square-free 2-matching algorithm, respectively. The author is obliged to Yutaro Yamaguchi for the helpful comments on the draft of the paper. The author is also thankful to anonymous referees for their careful reading and comments. This research is partially supported by JSPS KAKENHI Grant Number 16K16012.